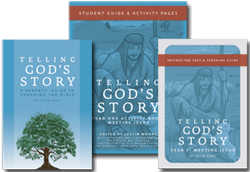 Get a 10% discount when starting Year One of Telling God’s Story! The Year One Combo Pack contains one copy of the Instructor Text, one copy of the Activity Book, and one copy of the Parents’ Guide, which gives an introduction and overview to the whole Telling God’s Story curriculum. Coloring pages, crafts, games, and activities for groups or individuals who are using "Telling God's Story." Introduce children to Jesus with this scripted, age-appropriate Bible curriculum for home, church, or school. In a rapidly changing world, how should parents prepare young Christians to have a vibrant faith in God and trust in Scripture? The Telling God’s Story, Year One Combo Pack gives you everything you need, all in one purchase. Telling God’s Story: A Parents’ Guide to Teaching the Bible, the user’s manual which gives an overview of the entire twelve-year curriculum, and helps parents understand the Bible for themselves.